The Jamaican pair of Jeffrey Panton and Mike Fennell repeated as winners of the 2016 Sol Rally Barbados yesterday in their Ford Focus WRC 08. 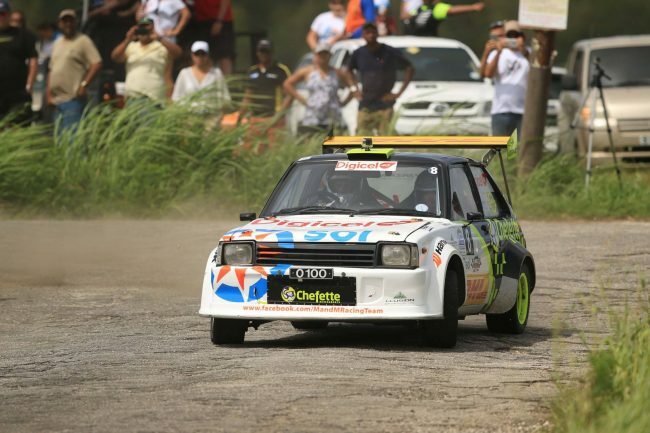 The 2015 winners ended with a total elapsed time of one hour, three minutes, 59.55 seconds to beat Barbadian ace driver Roger Skeete into second place. Skeete, behind the wheel of a Subaru Impreza S12B, and with Louis Venezia calling the notes, completed the rally with an elapsed time of 1 hour, four minutes, 44.88 seconds. In third position was Welshman Elfyn Evans behind the wheel of a Ford Fiesta and compatriot Craig Parry in the co-driver’s seat. They had a total elapsed time of 1:04:58.06. Roger Mayers and Sean Corbin who had a consistent rally in their Toyota Starlet, finished in fourth position in a time of 1:06:16.94. They were just ahead of the other Barbadian pairing of Josh Read and Mark Jordan in a Toyota Starlet who ended with a total elapsed time of 1:06:28.54. Roger Skeete and Louis Venezia finished second in the rally. Completing the top ten finishers were England’s Roger Duckworth and Mark Broomfield in a Subaru Impreza WRC S6; England’s Kevin Procter and Philip Hopkins in a Ford Fiesta; Englishman Rob Swann and Welshman Aled Edwards in a Subaru Impreza WRC S12B; Roger Hill and Graham Gittens driving a Toyota Corolla WRC; and Neil Corbin and Matthew Staffner at the controls of a Toyota Starlet. Mayers and Corbin were the highest placed of the two-wheel-drive cars. Roger Mayers and Sean Corbin finished fourth and were the highest placed two-wheel-drive finishers. One of the early front-runners on the first two days of the rally, French pair of Simon Jean-Joseph and Jack Boyere, had some mechanical problems and were force to abandon the action at Drax Hall. They actually ended day two on Saturday in second position behind the Jamaicans. Barbados’ Dane Skeete and Tyler Mayhew also had their rally brought to an end when their Peugeot 306 Maxi had a broken steering arm. Andrew Mallalieu and Geoffrey Goddard also had their issues on the day encountering a broken differential and bringing their rally to an end. Rhett Watson also had engine problems in the area of Bushy Park. Fans took in the rally from various vantage points. Fifty-three of the 81 cars that started the rally finished the event. Yesterday’s stages took in Drax Hall, Malvern, Padmore Village, before concluding with the Vaucluse Raceway SuperSpecial stage.